“Bottom delta” ≠ “top delta” (top_width_delta is_not_equal_to bottom_width_delta)Concept wise everything else remains (as in the width variation Type 2) same but just provided info will be little bit different. Here I have used different value for Bottom and Top Delta. Note: Similarly we can have other tables also (similar to table 2 and 4). 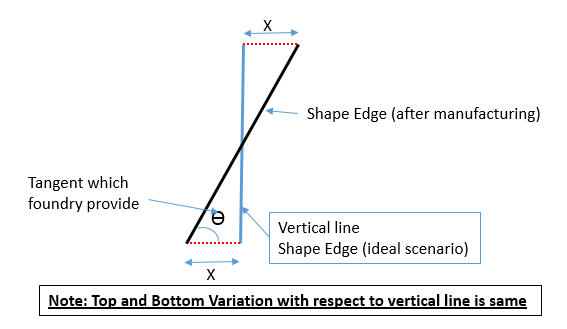 Structure wise after applying the variation type 3, we may get below patterns or we can say that we are modeling only below type of variation in the shapes. Can you model this type of variation (Type 3) using tangent values (tan Ɵ) as we have done in the last post (table 5)? I know, instantly – you can say yes. But remember in case of “tangent”, variation from the vertical line either on top or bottom should be same. Means as shown in figure. So, now how can you model this type of variation? I am sure something may be clicked in your mind. What about shifting the vertical line little bit outside the actual shape edge. Means, what about applying variation Type 1 first and then variation Type 2. We have applied Type 1 variation (discussed in previous post) on the very first shape (Edges AD and BC). New shape is with edges “ad” and “bc”. On this new shape, apply Type 2 variation with some angle (or may be same top and bottom delta width value). This will give you a new shape (trapezoidal) with edges UV and WY. 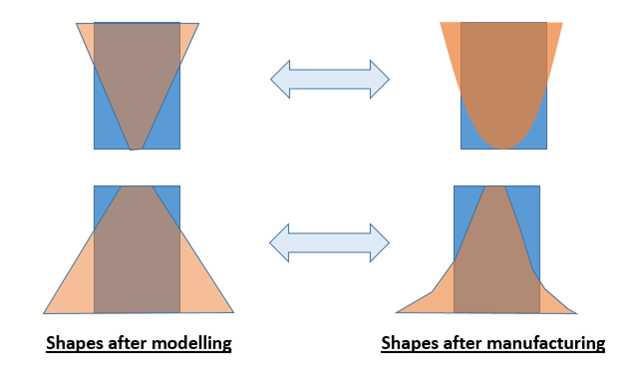 In the following diagram, you can see that original shape (Ideal one) is in blue color and Final shape (practical one – after variation) is brown in color. 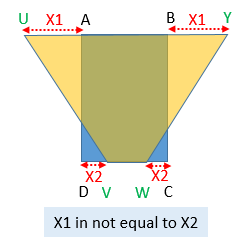 Here X1 is not equal to X2 (means top_width_delta is_not_equal_to bottom_width_delta). Using the variation type 3, we are more closure toward the actual shapes after the manufacturing. Please refer the below comparison. (Note: here bottom_delta and top_delta are different). Now, first one are 99% matching (except few curves on the edges) but 2nd figure still have some mismatch. Variation type 4 can help in that.